Barry Norris: Hey, listen up, everybody, whoever's doing this, they're having a little fun at our expense. 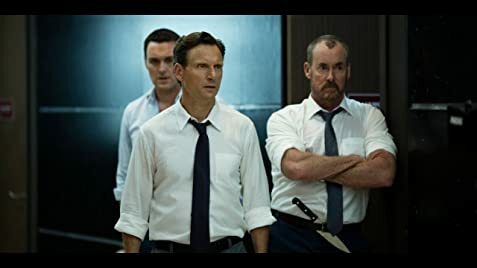 I'd been looking forward to The Belko Experiment since the moment I saw the trailer, it looked like it was going to tap into a sub-genre I love and the addition of the always excellent John C. McGinley really appealed. The time came around to watch it and as the credits rolled I was left more than a little disappointed. But why? It tells the story of an office block that goes on a lockdown, a mysterious booming voice barks orders at them that they must kill each other off in a sick social experiment. As you can imagine people react differently, and a blood bath ensues. Also starring career villain Tony "Ghost" Goldwyn, Josh Brener, Michael Rooker and Gregg Henry this James "Guardians of the Galaxy" Gunn written movie is a bloody battle royale type but just doesn't seem to accomplish in its goals. It has little character development, the lack of flow becomes very noticeable around the halfway mark and at no point did I find myself really able to care about these peoples plight. I went into The Belko Experiment with high expectations, maybe that damaged the film for me? Regardless it's a watchable effort but certainly feels like a missed opportunity at something greater. For some reason I was left feeling that the film would have made for a better black comedy, but I'll guess we'll never know.